Recently Wanda Sykes (47) and her wife Alex (wed in California, October 2008) joined the growing ranks of gay parents, as these first-time moms celebrated the birth of twins. Sykes has described herself “proud to be a woman, proud to be a black woman and proud to be gay” — and now she can be proud to be a gay black mom as well. Though today’s California Supreme Court decision qualifies her status as a gay black married mom–by affirming it for those like her who are already married but by denying the same option to others–the likelihood is great that that qualification will be undone in the not-so-distant future. The tide has turned, and the flood of images and stories of loving gay families like Wanda’s have already begun to redefine her status as part of the status quo. Firm stats on the number of gay families aren’t available – one recent study put the number of gay parents at between 2 and 8 million – but clearly they’re on the rise, with or without the marriage option. For lack of a better category, the CDC counts births to partnered gay women in the births to “single” moms (39.5% of births in 2007). •and because the world was not very receptive to gay families. But that’s changing fast. With the growing openness about gay relationships and the availability of sperm donation and adoption, lesbians can now explore family options as never before. And gay moms are doing fine, at least in part because, like Sykes, many of them start their families later in life. This turns out to be a good thing. 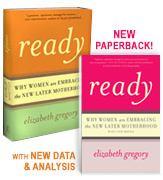 My study of later moms found that delay of kids allows women of all orientations and backgrounds to finish their educations, to mature and settle into relationships more likely to last for the long term, and to establish themselves at work (whether in the limelight or in a cubicle) — leading to higher lifetime salaries and to more flexible schedules (essential to care-giving parents) than are available to women who start earlier, in our very family unfriendly work environments. Gay women face the same pressures to establish themselves at work before starting a family as other women. As with their hetero peers, starting later means gay women have established themselves as individuals, with the kind of personal authority that allows them to be clear on what they want for themselves and can make them conﬁdent advocates for their kids. In addition, the gay couples I interviewed pointed out that it takes time to figure out who you are and to go through the coming out process, which makes it even more likely that gay moms will come to motherhood later. In the coming years, as society becomes more welcoming to gay people, that process may move faster. As with hetero women, delay may also lead later gay moms to infertility — especially women who seek to start biological families after 40 (this does not apply to the “other mothers” whose partners do the bearing and who in states that don’t allow gay marriage often become legal parents through adoption). But the steady rise in the birthrate to moms 35 to 45 over the past three decades and more has continued its rise in the latest data, and many women form families later through adoption and egg donation. Out gay women become moms for many of the same reasons as straight women, but accident is not one of them. These highly intentional moms are changing our understanding of what family can mean, and their successes inspire more change. In turn, the move toward expanding the availability of marriage to gay couples nationally will secure these families a fairer chance at their own pursuit of the happiness our Declaration of Independence calls an inalienable right.